I was giving a free 15 minute pitch consultation to a client the other day, when I saw something suspiciously conventional looking. The client’s deck… it looked so familiar… Yep – I’ve seen that before. It was the Google Pitch Deck Template. Down to the Google-blue color scheme, stock images, the title of the slides – everything. It was so obvious that it stung me and I knew I had to write this. I asked the client about it – He admitted a few months ago an investor asked him to send over his pitch deck. In a rush to research what a pitch deck was, he looked for a simple template he could use to put one together. He said he had little time to work on improving it since then. So, I asked him, “Did things go well with the investor you sent the deck to?” No! – He never heard from the investor again. It seems like a waste of time to go with such a bad representation of your company. I’ve seen templated decks over and over again; I can spot them almost immediately. If I notice them, so can Angels, VC’s and other investors who see so many decks that they spend on average, just 3.75 minutes reviewing each one, according to a DocSend study of over 200 pitch decks. Don’t Use This Pitch Deck Template – We’ve created a pitch deck template that you shouldn’t ever use. Pitch Deck Templates Put You in a Box – How your unique value proposition and story get diluted with a one-size fits all approach to marketing. So Why Don’t Pitch Deck Templates Work? – Reasons why templates are bad for your business and are a waste of time in the funding game. Other High Profile Pitch Deck Templates that You Shouldn’t Use – Links and summaries of some other templates that are not to be used, but could be ok for structural references. When Customizing Your Deck, Don’t Forget to Think About These – Considerations and things that people often overlook when building their pitch deck and telling their story. If Not Templates, How Do I Put Together My Pitch? – Things to consider if you are attempting to create your pitch deck alone.  Get More Time Today – Shameless plug for getting your Pitch Deck done right from the beginning with Pitch Deck Fire – Saves you time and $$$ and allows you to focus. Ok, so I’m going to do something that I swore I would never do. Release a Pitch Deck Template based on common themes we see from the thousands of pitch decks we’ve designed or seen over the years. I hate when I see templates, and it makes investors cringe. If you must use a template, know that it is a bandaid fix. A temporary stop-gap and a first step. Spending the time to put this together right will be worth it and working with a pitch deck design expert to make sure that you are fully telling your story in a compelling way can make sure you streamline your efforts. Here’s our Pitch Deck Template. Again, we implore you not to use this or any other pitch deck template. Getting your message down and your brand and style to match, from the beginning of your business, will set your company up for success. What we’ve seen companies do after working with us is amazing. They use their custom pitch deck to unify branding, message, sales, and the overall customer experience. With minimal work we’ve helped them easily convert previous work into sales collateral, investor teasers, newsletters, and other types of communication throughout the next phases of their businesses. Nothing about business is about being the same as everyone else. Not in marketing your product (you want to stand out), not in your product itself (it’s better than the competition), not in sales or operations (we can deliver better, faster, more, higher quality, etc.). Why would your pitch deck be any different? As the pitch deck has become more and more ubiquitous, and necessary for raising funds, I have seen more and more people looking at their pitch deck as a thing to “check off the list.” A necessary pain in the a$$ when your raising funds. And more and more entrepreneurs are using templates to streamline and simply the process of putting together their pitch. I get it. You’re busy. You’ve got a whole company to launch, run or grow. The last thing you want to do is take time away from the things you know how to do well, to do the things you don’t. You’ve likely looked up “what is a pitch deck” or “pitch deck template” in hopes that you can download a template, fill in the blanks, and have a stellar deck. But it just doesn’t work that way. I’m sorry. 3. So Why Don’t Pitch Deck Templates Work? Your pitch deck is essentially a marketing document for your business as an investment. It needs to grab the investors attention, it needs to be compelling, easy to follow, and spur them to action. Pitch deck templates treat every company the same. They suggest an over-done slide flow, they have mundane slide titles, they have images and color schemes that have been used over and over. They just don’t stand out. And they don’t do your company justice. Note: This is also true for low cost deck design companies that mostly work off of templates and pre-made slides. My main concern with templates is: Investor Time is Valuable and You Usually Get One Shot. I see so many pitches go wrong; creating a painful 5 – 10 minutes for everyone – the audience, the investors, and the founders that are bombing. Where if they had invested in a deck and practiced more, they would have left their audience interested, excited, and ready to hear more. This is your one chance first impression. You can drastically shorten your fundraising efforts and get funding faster by having a clear well designed pitch deck. What is your Valuation and how did you arrive at that number? Just having an initial investment round (friends and family or otherwise) is not enough to demonstrate tangible value. Really know your financials inside and out. Be realistic about where you are, how and when you’re going to grow, and what it will take (investment + actions) to get there. Traction is showing positive signs that you are connecting with your customer base and getting their buy-in on your product. Traction is important no matter what stage you are in with your startup. If you are in a pre-revenue stage it is good develop a strategy that will get customer commitment before your concept is fully developed. Think about a beta release, or pre-sales. If you already have revenue, increasing sales shows growth potential, and who knows, if you focus on sales growth enough, you might be able to skip fundraising all together. How you are going to duplicate your efforts at scale can be a big part of how you form your early teams and operations strategy. The ability to engage customers and repeat performance in new territories is key to capturing market-share quickly and this can be done easier if you build your sales organization for scale from the beginning. What works for you in your current market might not work as well in others and it’s good to know the factors that drive success. Where are you planning to go and why are those ideal locations for expansion? What early traction and industry trends can you show from those areas to help confirm your market hypothesis? What is the future of the company? How is it leveraging its current market and how are they positioned in relation to competitors? How is what you are doing today contributing to the further growth potential of the company? Demonstrating the return on investment is key and investors want assurance that the business will grow over time. That is the main benefit to getting in early. There is not a lot of tangible information on what has or hasn’t worked, and they can get a deal by taking a risk. The more potential they seen in the operation and team, the easier it is for them to take the risk – especially if there are strong innovation paths in the current captured market segments. If you’re still convinced that you need a pitch deck template, download our here. 6. If Not Templates, How Do I Put Together My Pitch? So, don’t skimp on how you are getting your message out. It’s important from the beginning that founders get their message and brand aligned around sales and marketing efforts. If you put the time and effort needed to do the pitch deck and sales decks right, you will be setting the tone for what comes next. We’re biased, but we recommend seeking professional advice when designing your pitch deck, branding and marketing collateral, so you can get the right message out from the beginning. Not to mention, having the 3rd party check helps to make sure you have critical elements figured out and adequately explained. Start right from the beginning. Don’t reinvent the wheel, but don’t be constrained by something that doesn’t allow your story to flow naturally. You can download our template to get you started, but please don’t hobble yourself with a pitch deck template. Invest time and money upfront, and the benefits will trickle down into a successful funding round or revenue related efforts. Those who go through the rigor with a professional, will likely increase their confidence in what they are bringing to the table. This helps to strengthen funding chances and the ability to field questions that might come up. Developing high-quality marketing materials is an important task and not one a founder should tackle on their own. Clients often come to us after wasting 40 to 60 hours trying to put together and design their pitch decks appropriately. Our designers spend around 20 hours on a custom project and the end result is highly professional and effective. Project costs are far less than the amount of time a founder would spend trying to get the same quality on their own. With all the extra time, you can focus your efforts on getting the traction you need to seal the deal. What you do in the first months of business influences whether you can make it with the runway you have. Don’t be tempted by short cuts and remember that business success is about knowing your customer, duplicating what works and innovating a better solution. Templates don’t work. Download ours if you wish, it’s the best we think there is. But seriously, don’t just use this pitch deck template. Your business is unique. Instead, get your message right and reap the rewards in your next funding round or pitch competition.